The financial community uses a portfolio modeling theory developed in a 1952 academic paper by Harry Markowitz. For his work on this Modern Portfolio Theory, graphically depicted as the Efficient Frontier, Markowitz won a share of the 1990 Nobel Prize. Despite shortcomings of the model it is used by main-street financial advisors due to its simplicity and availability within software packages. Diversification is thus a major component of MVO. The Efficient Frontier implicitly calculates correlation by using the portfolio’s co-variances to reduce risk. Diversification is explained by correlations. Changing the variable correlation from being implicit to explicit gives the investment manager more control and inherently showcases the attributes of investing in diversification enhancing investments like emerging markets and alternative investments. Diversification Optimization is a model that builds on the geometric analysis introduced by the Efficient Frontier. Just as the optimal portfolio combine to form the Efficient Frontier, the single greatest optimal portfolio rises to form the efficient frame or convex hull of the global optimal allocation model, dominating all others. This is what creates the dominated regions, as the more lengthy vectors dominate the short and unique assets dominate greater regions juxtaposed similarly grouped assets which compete and crowd out one-another for allocation space. 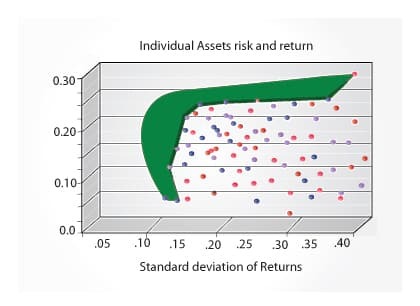 The Efficient Frontier model shows a simple geometric graph of the trade-off between risk and return. The frontier itself is a composition of many portfolios, Portfolios on the frontier provide a return to risk premium over any of the assets that combine to create the portfolios. The remarkable twist to the frontier is that the frontier extends beyond any one asset. This gap explains the benefit of diversification. This system allows the more attractive assets to dominate other local assets. Given any two assets with a perfect positive correlation, the asset with the greater vector length will always dominate its peer. Attractive characteristics extend farther from the origin and any asset with inferior characteristics will be dominated, inefficient and unallocated. Modern Portfolio Theory judges a portfolio of investments by two characteristics: risk and return. Risk and return are certainly the correct parameters for accessing any one security or any one portfolio. This is the definitive relative methodology. However, assessing the composition of an entire portfolio of securities requires more information than risk and return; in fact, it does not even require risk or return. In any case, it requires a holistic representation. Any holistic representation must account for the relationships of the portfolio constituents. Diversification Optimization captures this requirement by correlating the assets of each vector. Correlation tells us about the relationships of each portfolio constituent. The Diversification Optimization portfolio condenses all of the information in a correlation matrix into an intuitive three dimensional model portfolio. Correlations of assets are considered along with technical, statistical or fundamental information manifesting to form forward-looking risk and return assumptions that provide the investor with a complete picture of their portfolio’s opportunities, strengths and weaknesses.